History of the Bible Believers' Evangelistic Association, Inc. In 1952, God used a Gospel tract by Dr. John R. Rice to be instrumental in the salvation of Leon Bates. In 1953, Leon and Pat were married. After service in the United States Air Force, Leon attended the Arizona Bible Institute in Phoenix, Arizona. Leon worked for 20 years in electronic work in the aero-space field while continuing a ministry of Bible teaching and evangelistic work. Leon and Pat left their secular jobs in 1970 for full time ministry work. In 1970, the Lord led them to establish the Bible Believers' Evangelistic Association, Inc. as a non-denominational, non-profit religious corporation in Dallas, Texas. The charter purpose of the ministry was to "teach, preach, proclaim, evangelize, publish and distribute by oral, written or other means, the Gospel of our Lord and Savior Jesus Christ and the Holy Scriptures of the Christian faith." In 1980, the ministry offices were moved to Sherman, Texas. 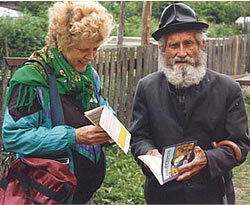 Here is a "Statement of Faith"
Starting in 1992, Leon and Pat worked with other Christians during several summers in Russia, distributing medical supplies, Russian Bibles and Russian Gospel tracts, teaching Bible classes and leading precious Russian people to faith in Christ for their salvation. 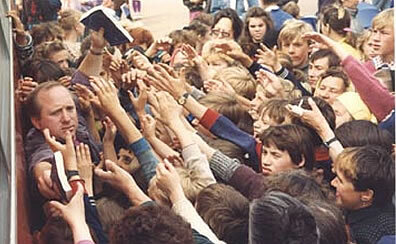 Pat loved people. She loved to share the good news about Jesus Christ with people. Pat is here shown giving a Russian Bible and a Russian Bible Map tract to an elderly Russian man in a small village along the Volga River, between Moscow and St. Petersburg. Who can forget the spiritual hunger of the precious Russian people? Pat is in the bus handing Bibles down to a team member, who is pinned against the wall of the bus. As he tries to distribute the free Bibles to the people, they are reaching ... trying to get their hands on a Bible for themselves. Now do you understand our JOY in missionary work in Russia? In 1996, after 3 years of treatments for cancer, Pat "graduated to heaven." Six years later, God brought Ruth Gross, a Godly Christian widow, into Leon's life and the ministry. 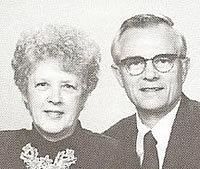 Ruth and her late husband, Leo Gross, were long time friends of Leon and Pat. Leon and Ruth were married in 2002 and now they continue the ministry work together. He took her to Russia on the 10th Anniversary of the St. Petersburg Bible Church to meet the wonderful Christian believers there. Since 1970, millions of the tracts have been printed in several languages, which can also be downloaded freely worldwide on this website. The ministry materials produced for believers to use for God's glory include class room size poster charts for teaching, Audio CD, Power Point CD and DVD video tools for Bible teaching and evangelism. In December, 2009, God led Matt Galyean to contact Leon offering to help keep the Bible Believers’ Evangelistic Association (BBEA) ministry and materials going after the Lord called Leon home. 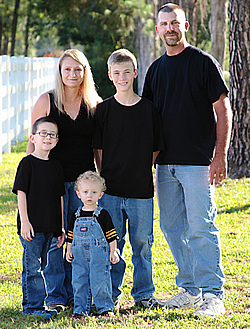 This photo taken June 2012 shows the Galyean family, Angela, Matt and their three sons, Steven, Bradley and Conner. They live in East Texas, about 100 miles S.E. of Leon. By July 2012 with the help of friends and God’s provisions, they had constructed a beautiful new 2100 sq. ft. building near their east Texas home for the ministry offices and operations. Matt and Angela are now the directors of BBEA. Leon is committed to be available to assist them as needed as long as he lives. God has been gracious to lead the Galyeans to continue this ministry by faith so believers worldwide can use the BBEA materials for the salvation of souls for the glory of our Lord Jesus Christ. The ministry is approved by the Internal Revenue Service and the State of Texas as a non-profit religious organization. Contributions to "Bible Believers' Evangelistic Association, Inc." are income tax deductible and every gift will be gratefully acknowledged with a receipt from the BBEA office. This IRS approved ministry was started in 1970 and continues to operate with the help of donor gifts. Many ministries and missionaries in several languages use these materials. If God leads you to help support the Galyeans and this ministry, we will appreciate your partnership for our Lord's glory. For your convenience, you can also click on our Donate Link.